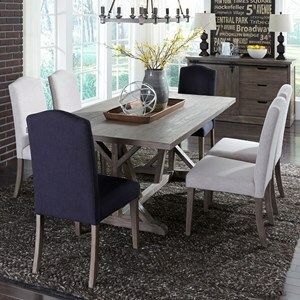 Create a space where you can dine with family, gather with friends, and have a place to work or study with this contemporary rectangular dining table and chair set. 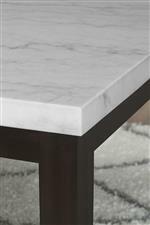 Its cordovan dark cherry base complemented with its white marble veneer top creates a striking dark and light duality that holds a casual appeal. You're sure to dine in comfort with these upholstered side chairs. 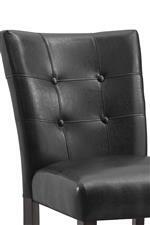 Their memory foam seats will give you a luxurious dining experience, while the black polyurethane upholstery is handsomely tufted to complement their suave appearance. 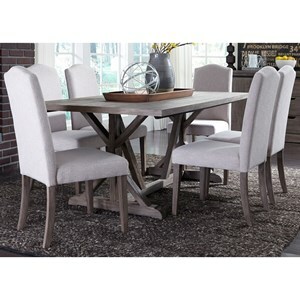 The Francis 7 Piece Table and Chair Set by Steve Silver at Van Hill Furniture in the Grand Rapids, Holland, Zeeland area. Product availability may vary. Contact us for the most current availability on this product. The Francis collection is a great option if you are looking for Contemporary furniture in the Grand Rapids, Holland, Zeeland area. Browse other items in the Francis collection from Van Hill Furniture in the Grand Rapids, Holland, Zeeland area.